Most dogs love nothing better than a day spent playing with you, whether it’s hiking, walking, playing in the park or boating and swimming. Some dog breeds don’t swim well enough to be safe near water without some kind of life vest or flotation device, however. And even dogs from water-loving breeds can have trouble if they’re mature, tired, ill or caught by surprise in the water. Small breeds can be hard to fit for a life vest, but it’s important to take the time to get the right one. Because of their size, small dogs are at risk in a normal size life vest. This holds true for people, too. A child or small person in a life vest that’s too large can all too easily slip out of the vest, or it can float right off them, leaving them vulnerable in the water. A vest that’s too large for your dog can slip off or float away, defeating the purpose of using it in the first place. It’s important to find a small dog life vest that’s designed to fit your pet. Even a small vest should have straps that are fully adjustable. Toy and small dogs come in many different sizes, so adjustable straps are a must. A one-size fits all vest could cause problems being too loose or too tight. If your dog is extra small and the straps don’t adjust, the fit simply isn’t going to be safe. The jacket could come off too easily. If the straps don’t adjust and they’re too tight, your dog could be uncomfortable and even panic at being so restricted. Both of these scenarios could be dangerous in a situation where the dog ends up in the water, especially if it’s accidental or unexpected. Look for features that make the life vest fit properly and comfortably, but don’t forget about other safety and convenience features. The vest should have some kind of a ring for attaching a leash or tether. Avoid those with plastic rings that could crack and break, or any that aren’t securely attached. A metal ring that’s attached well is a must for a dog life vest. 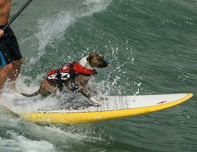 And a handle that makes it easy to grab your dog to lift him out of the water is an extra touch for safety. While the vest itself does give you something to grab for, a handle on top means that when you lift, the pressure will be distributed evenly. Grabbing the side or edge of a vest to pull a dog from the water can make the dog struggle and feel as if it might slip away, which can make it harder to hang on to the vest. 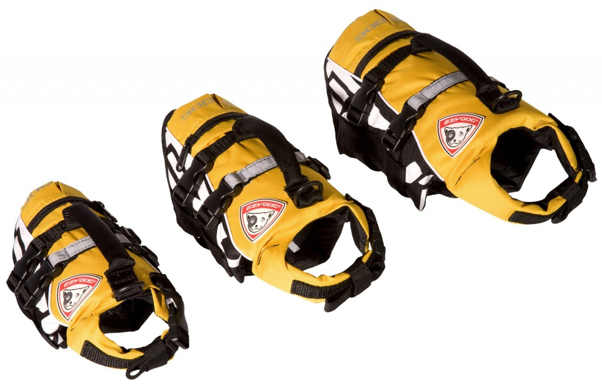 EzyDog makes wonderful dog life vests for dogs large and small for comfort and safety.